Hot days have me craving fruit. 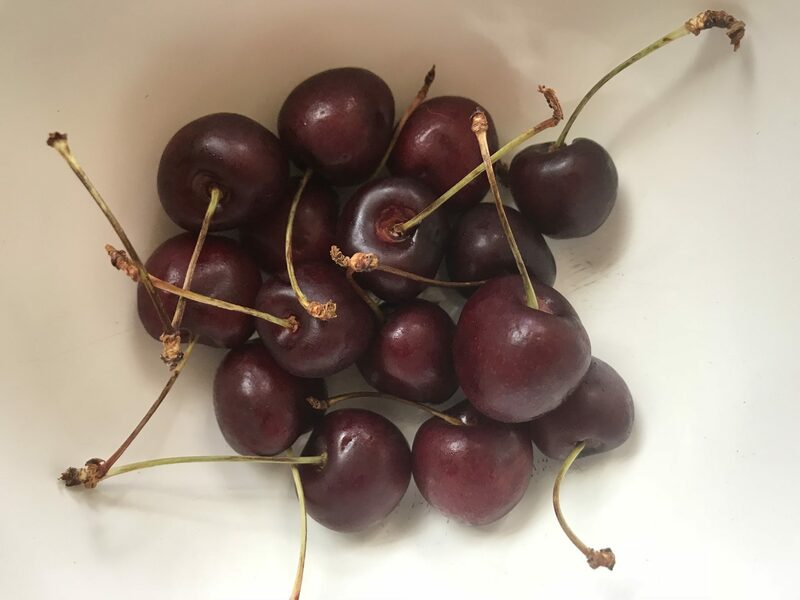 Be it cherries that have cooled in the fridge overnight, cubes of cantaloupe, plums straight off a tree or a giant bowl of watermelon slices, there’s something about fruit that helps quench the doldrums of a baking-hot summer. Part of the reason for that, of course, is because many fruits are reaching the peak of their seasons right now, and are at both their most delicious and most available. Apricots are turning golden-yellow on the branch, cartons of cherries are piled high at farmers markets stands, raspberries fall off their bushes like sweet red gems, plums are sold by the bagful with their punchy piquancy, melons plucked off the vine emanate intoxicating perfumes and peaches — those juicy kings of summertime sweetness — are showing up at markets. All are grown regionally; many right here on Wright’s Mesa. Yep, it’s high time to load up on fruit. Because it is so readily available, summer is a great time to purchase bulk fruit — such as boxes of peaches, or bags of windfall plums — and save money in the long run. And while fruit is always a key part of a healthy diet, the freshness of locally grown fruit in the summertime guarantees maximum nutritional benefits. The USDA’s food guide pyramid recommends two to four servings of fruit per day, and for good reason. Fruit is rich in fiber, and filled with vitamins, minerals and antioxidants that will help strengthen your body and fight disease. It’s a great snack, and a low-calorie way to delivery a kick of sweetness without the added ingredients and sugars of processed treats. Plus, fruit is easy, requiring little more than peeling before it’s ready for the plate. If you are like me, using up the bounty of summer fruit isn’t typically a problem. That’s because when fruit is in season, the simplest preparations are often the best. Do as little as possible to those exquisite fresh strawberries, that bowl of shiny cherries or the peach that is so juicy you need a napkin to eat it. No cooking, prep, or fancy recipes required. Breakfast: An easy and delicious way to start off a hot summer day is with a bowl of plain yogurt topped with fruit and granola. Sliced peaches, raspberries or blueberries are great toppers. For heavier dishes like eggs and potatoes, cubed melon or watermelon make a perfect light side. Stew apricot or strawberries with oatmeal for a warmer dish. Top toast with cream cheese and thinly sliced plums or strawberries. And, of course, throw whatever fruit you have on hand into a smoothie. Lunch: Add peaches, apricots or even blackberries into grill cheese sandwiches for a marriage of sweet and salty. Incorporate fruit such as strawberries, nectarine or plums into an arugula or spinach salad. Make peach salsa for your burritos. Compose a salad with watermelon, mint and feta cheese, or cucumber, honeydew melon and toasted nuts. Make watermelon juice by tossing chunks of fruit in the blender with a little lime juice and mint. Or just eat a handful of cherries with your sandwich. Dinner: Top pizza with nectarines or pears along with bacon, walnuts and gorgonzola cheese. Incorporate apricots, peaches or plums into chutneys, barbecue sauces or glazes — these are great paired with pork or chicken. Add melon to chilled soups. Add berries or cherries to grain salads or toss in green salads for a punch of sweetness. Wrap cantaloupe with prosciutto for an easy side dish. Dessert: Here is where the possibilities are truly endless. The trick is keeping is within the bounds of healthy. Fresh, local fruit doesn’t need much added sugar, after all. So try some of these options: make your own popsicles using fruit blended with yogurt and honey; make a platter of cold cut fruit and dip it in whipped cream; grill peaches and serve with a little vanilla ice cream; make a rustic galette filled with nectarines and apricots or churn up a raspberry sorbet. Just make sure you get your fill of fresh fruit before summer flashes by.